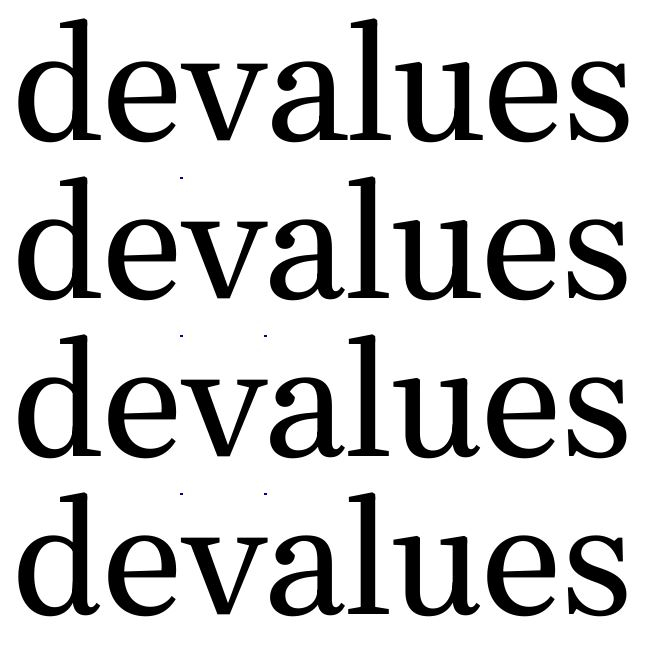 Does anyone have strong opinions on whether the bottom right serif on /d/ and /u/ should or shouldn't match the one on /a/ ? The approach in the upper sample is not common. The lower sample shows a more conventional construction of /d/ and /u/. The upper sample is thus a more unusual and playful take on an otherwise conventional serifed typeface. It doesn't have to match, but it shouldn't be the only deviation in the whole. On the other hand one sees a strait serif and upper terminal on the a, sometimes. It looks out of character here. Alegreya pulls it off very nicely, though. There are no true rules. It depends from the balance you would obtain between the horizontal continuity of the reading, the texture you would give to text area, the kind and level of harmonization you would have between your letters, and several other considerations. But if you like the impact of some typeface (ancient or modern), ask you which details play for the most in what you like. Bernhard Modern and Koch Antiqua have the curly foot serif. It always strikes me as a playful, historicist, ductus-savvy feature. Thanks everyone. For the sake of inclusion I tried the a with a foot serif. It really works better with the curl. I don't like the curl on d but I'm undecided which I prefer on u. I think I'm going to be boring and go with the 2nd line. To me #4 is the most interesting, but #1 is nice too. I'm not really going for "interesting". I think #2 default, and u with curl as alternate. I don't think the curly d or footed a are working. In #2, are there other glyphs that might keep the "a" company? If you don't want interesting, #1 is solid. Have a look at Unger's Paradox. 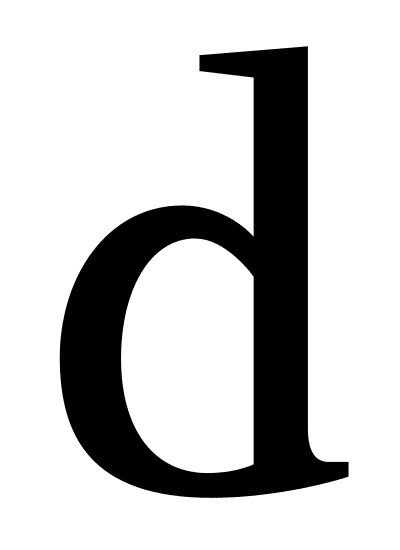 'Curly' bottom serifs of d and u are working quite nice there. For #1 to work (better) you'd have to shorten the serif on /a or give it more spacing. But I'm not sure it would work very well either. I think the reason the curly terminal doesn't work in /d/u is that their structure is less petite than that of /a. When a curly terminal is found there, it is normally expected to be larger. With an emphasis on ‹there›. It works in Paradox because of a trick – visual ambiguity. It is somewhere between curly and flat (like a serif). Whether it is considered as a curl or as a serif is left to the viewer. Absolutely correct. It's also why I placed curly between quotation marks. The point is that it is possible to have rather informal bottom serifs on d and u. Whether it is considered as a curl or as a serif is left to the viewer. Except the viewer of a text face only does such conscious things as an exception. Speaking of selective and sensitive diversification of the like/related design elements. Griffith’s and Carter’s Monticello (Linotype: 1946, 2002) is a good example. @Maxim Zhukov I wonder what the rationale was behind the /k. Whenever I see people go wild with either /k or /z I get this vibe that they, as English speakers, don't care about these letters and their frequency in other languages, especially Slavic. Would these forms feel more appropriate? @Maxim Zhukov Oh, I just meant making the serifs different. While the top serif on /d is justified by the empty space above the bowl, the one in /k stands out from /b/h/l far more than b/h/l differ between one another. To add insult to injury, the bottom serif is trying to become a swash descender. Of course Monticello is a revival, and the above arguments might only make sense for a new design targeted internationally. With my initial comment I meant that English speakers occasionally make /k/z weirder than usual. I mean, the creators of Monticello clearly wanted to diversify the typeface by introducing idiosyncrasies into a few select glyphs, and /k seemed convenient because it's a relatively rare letter in English. About the forms of /K/k you show, you could say they might be more suitable for Slavic languages (they help avoid disrupting the stem pattern with strictly diagonal strokes), but I'd say they're a bit unusual for most readers. This trend didn't catch on, at least not in Poland. Regarding /Z/z, I don't know what I'm comparing to, but they seem normal. Adam — Keep in mind that when CH Griffith designed Monticello for Linotype in the mid 20th century, he was explicitly trying to recreate the idiosyncrasies and capture the historical charm of Binny & Ronaldson’s Pica Roman No. 1 from ca. 1796 (later referred to by the name Oxford). I’m not sure how much you can ascribe to the original punchcutter any clear desire “to diversify the typeface by introducing idiosyncrasies into a few select glyphs.” It may have been the limits of his ability to maintain consistency. And, indeed, the idiosyncratic differences are more pronounced in Monticello than in the samples of Oxford I have seen. But the difference in k is there in the original, so that’s how Griffith found it. And I doubt that Binny singled it out based on infrequency. It may have been the limits of his ability to maintain consistency. Really? You mean mental ability? Manual? “…it depends on the skill of the punch-cutter whether or not such dimensions and component parts as may be common to several letters are precisely and exactly the same in them all.” —Bodoni, Manuale, quoted by Zapf. “…what he wants to say is that all the great styles of the past have been the equals of their contemporary technologies, and that when our own architecture matches our own technology then we shall have an architecture as good as the Parthenon.” —Reyner Banham on Le Corbusier’s Vers une architecture. So the question is, what kind of typeface serif scheme best matches the technological capabilities of today’s font making tools and formats? Perhaps the ability of contextual substitution that the OpenType format enables provides the answer, namely that the shape of serifs may be determined not just by what looks good for a particular glyph when viewed in isolation, and not just in relation to the treatment of serifs in similar-shaped letters, but may now vary according to what works well with the adjacent letter. Bear in mind that the reader’s fixation, in which there exists sufficient acuity to notice serif shapes, only covers a few letters, so it is unlikely that a variation between fixations, of serif shape for a particular letter, would be perceived. In conclusion: from the reader’s perspective, there is no ideal serif shape for a particular letter in a typeface, this is only an issue for those who study typefaces as one-glyph-per-character aesthetic optimizations.